As part of the congregational observance of the legacy of 1517, the Miller Sunday School class will sponsor a special one-day exhibit on Reformation Sunday, October 29, in the room that will become the church museum. The museum is located in Peeler Hall, just to the left of the Welcome Desk. Woodblocks from a 1600s book depict themes of the Reformation. 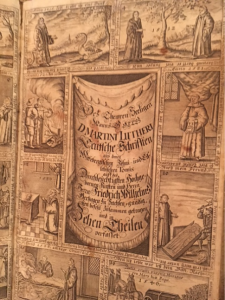 A collection of Lutheran books from the Reformation period will be on display. The generosity of David Pope, a member of St. John’s, Statesville, has made this possible. Pope has been collecting German-language religious books since the 1960s. The exhibit will include both Luther Bibles and collections of his commentaries, including his essays on the Psalms, printed in 1556. The books will be on display from 8:30 am to 3:30 pm on Reformation Sunday. Dr. Freeze will be on hand at the end of all three services to answer questions about the exhibit and the planned museum. At 2 pm, Freeze will give a short talk, “Printing, in Historical Context” in Peeler Hall. The public is invited to attend. In 2018, the St. John’s museum committee will continue to interpret the legacy of the Reformation with its first long-term exhibit. “The Ministry to the Forest Dwellers” will examine the life and labors of the first German pastors to serve “der stad kirk,” that is, “the Salisbury church” that evolved into St. John’s in the 1800s. There will be a commemoration of the 1768 deed given by John Lewis Beard, which provided the means for the first sanctuary and cemetery. The Archives Team is seeking items to add to its collection. During the renovation of the office building, the church archives were moved from the old nursery under the sanctuary to the administrative hall. Team members Linda Safrit, Pat Epting and Barbara Rufty have worked to organize the new space. They formed as a team seven years ago and continue their work most Wednesday afternoons. Members who would like to do research or simply browse St. John’s history can visit the room by contacting one of the committee members. Also, if you have old pictures, articles from St. John’s past that need to be preserved, please get in touch with one of these ladies.